"The war between humanity and Faerie devastated both sides. Or so 15-year-old Liza has been told. Nothing has been seen or heard from Faerie since, and Liza's world bears the scars of its encounter with magic. Trees move with sinister intention, and the town Liza calls home is surrounded by a forest that threatens to harm all those who wander into it. Then Liza discovers she has the Faerie ability to see into the past, into the future, and she has no choice but to flee her town. Liza's quest will take her into Faerie and back again, and what she finds along the way may be the key to healing both worlds." Whenever I hear that a book contains faeries, or something along the line of faeries, I instantly want to devour the story. 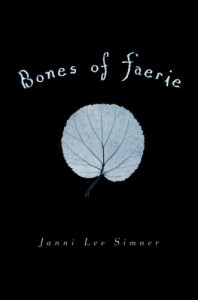 Bones of Faerie, sadly, did not fuel my hunger. The overall idea of the book was intriguing to me in the beginning, and I decided to give it a chance to see how it all played out. A war between Faerie and humans was interesting right off the bat. I have never encountered another author writing about the subject matter of a war between the two worlds before. Despite the uniqueness of the plot description, the overall book did not live up to the expectations I hoped it would. There was not a lot of information about the war at all during the duration of the plot. The only information given was that the war left the World (the human realm) with plants and animals genetically mutated to search for the taste of human blood, and the war lasted around 20 years. That's it. I was left questioning the whole history aspect of the war throughout the entire book. The main character Liza, the overall pace, and the content left me feeling like I was treading through water to finish. Reading felt more like a chore than something I do for pleasure. The actions of the main character was annoying and she repeated herself often enough that I would skip over her lines if I noticed the pattern. As for the content, it seemed that the author was biting off more than she could chew in this case. Different elements would be thrown into the story line and instead of feeling shocked about the development, I felt confused and wondering how those elements tied into the specific scenes they were presented in. Overall, I was highly disappointed with this book. The overall idea of the plot and the characters was intriguing, but the way that information was presented led the whole thing to go downhill. I had high hopes for this, but I will still give Simner a chance and read Faerie Winter.